Kext files are kernel extensions for Mac OS X, typically these are device drivers for hardware like the graphics card, wireless card, printers, etc. Most Mac users have no need to directly interact with .kext files, but for those who do, installing them can be annoying. Sure you can install .kext files manually by digging around in /System/Library/Extensions/ and performing a bunch of permissions voodoo, but there’s an easier way. Kext Drop is a free tool that makes installing kernel extensions as simple as dragging and dropping them into the application window or Dock icon. Then all you need to do is click “Install”, and all the permissions changes are handled for you, it doesn’t get much more simple than this. As already mentioned, most people won’t need this application, or have any need to tweak with kext files and kernel extensions. This is usually the realm of deep troubleshooting and Hackintosh installations, but not necessary for the average Mac owner. 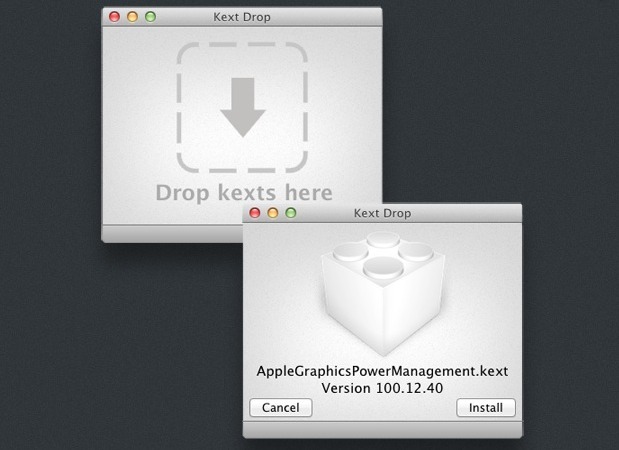 Kext Drop is compatible with Mac OS X 10.6 and 10.7 and is created by Cindori, the same developer who made the TRIM enabler tool (which is itself an application that modifies kernel extensions). Or just rely on the old trusty manual kext install and uninstall method, that works too. Happy kexting. 3. Unpacker: Check mkext’s content kexts and unpack it. 4. Kext Information: Check kext’s architectures and dependencies. I have to start my MacBook Pro in safe mode because of logic board failure. I would like to start up one of the USB serial ports is this possible with Kext Drop? Lot of thanks for the tutorial. This will help me a lot for initialization of my Driver level programming..